What better way to make your house feel like a home than with the addition of a few great pieces of Chesterfield furniture? It can definitely be an investment, but if taken care of properly, leather furniture can last for years. Over time, leather furniture accumulates body oils, perspiration, dirt, and more. 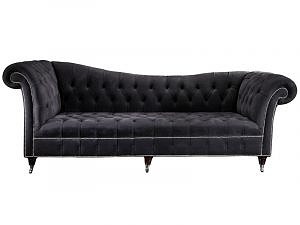 The best thing you can do to rid your Chesterfield furniture or dirt, grime, and stains is to clean and it weekly. During your weekly cleaning, give your Chesterfield furniture a once over with a dust rag. If you’re feeling extra ambitious, pull out the vacuum and work in between and under the cushions to get rid of any hidden crumbs or dirt and dust particles and especially around the buttons. You should never forget to conduct a spot check before using any cleaning product on your leather upholstery. If you accidentally spill any liquids on the upholstery, clean it up immediately. Simply use a damp cloth to blot away the stain. People often ask about the difference between nubuck and suede. Suede and Velvet give the Chesterfield furniture a more contemporary look which is favored by many interior designers like our Charlie Chesterfield Chaise Sofa. Rub the stain with the suede brush or polishing cloth. This will prepare the area by removing any debris or dust. Moisten a terry cloth rag with white vinegar or rubbing alcohol and lightly dab the couch. Be very careful not to over-saturate the stain. Rub the stain gently to remove. If you follow these simple rules, your Chesterfield furniture will last you a long time giving your home that special ambiance and comfort. All our furniture is custom made to order in England. For more information please contact us at [email protected], we would be more than happy to assist you with your furniture needs. For more updates, offers and information on our Leather Chesterfield Sofas, why not follow our company on Facebook and perhaps send us an image of the space you would like to fill with one of our luxurious leather sofas or armchairs.